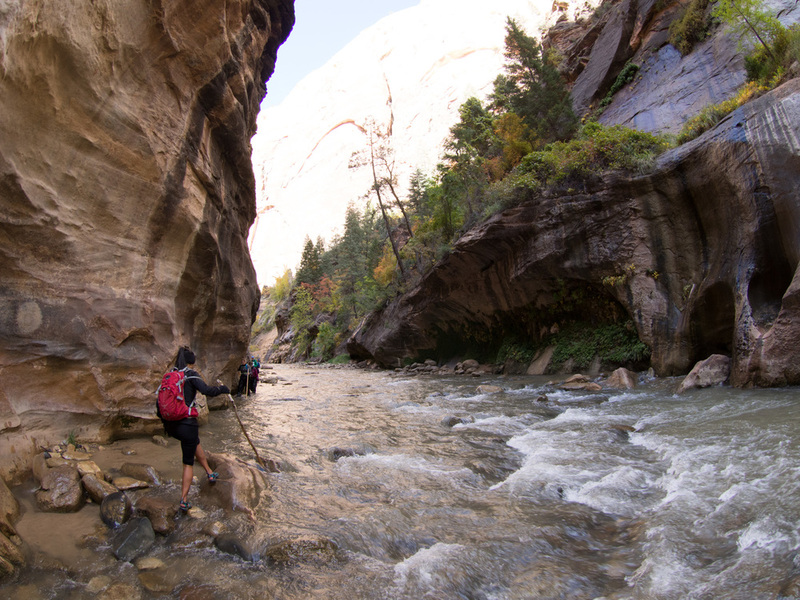 The Zion Narrows is a famous hike that requires you to get a little bit wet if you want to see some of the best views in Zion National Park. Doing this as a dayhike starting at the Temple of Sinawava lets you choose how far in you want to hike, and you don't even need a permit! It's 4.5 miles to Big Springs one way, but the views all along the way are stunningly beautiful. You definitely want closed-toed shoes, because you are trying to balance on slippery smooth boulders in strong current during the many mandatory river crossings. A walking stick really helps, and you can generally find one once you reach the water portion. While doing it in the fall, a dry suit and boots are highly recommended because we definitely froze without them. You should also check trail conditions at the NPS website. 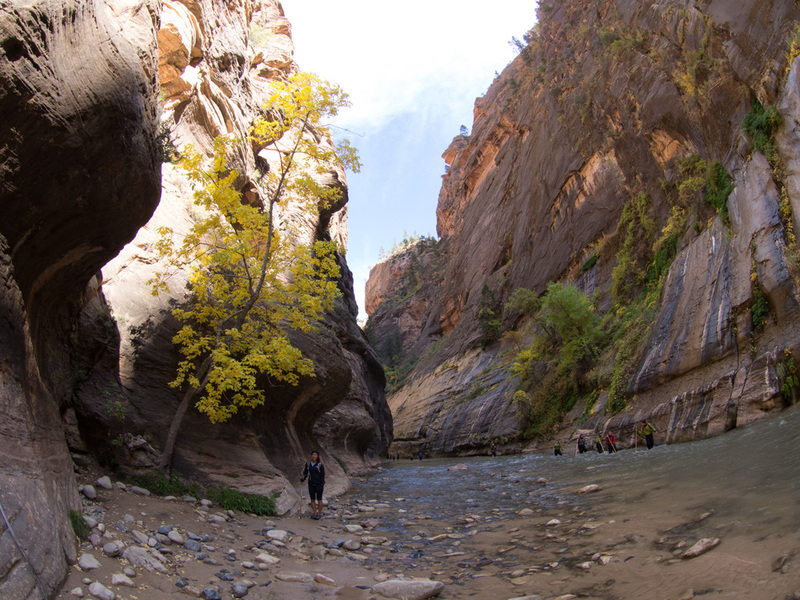 After our Angel's Landing hike, we decided to do a short hike into the Narrows. We had already done this hike coming out of Orderville last year, but this time Kyle had a waterproof housing he wanted to test out. We got off the bus at the last stop at the Temple of Sinawava, and it was a short, paved, and relatively flat hike into the canyon to get to the start of the water. The sun had already set behind the canyon walls, and we quickly selected our walking sticks from a bunch of sticks leaned against the wall near the start of the water's edge. I was excited to try out my Keen Whisper water shoes, and Kyle was just wearing his Teva sandals. The water was frigid! We didn't rent socks or dry suits since we were doing a very short hike, but the aching in your feet before they start to go numb is definitely not pleasant. Many of the hikers we saw were leaving the Narrows as we headed in, and most of them were wearing drysuits. We did dry bag all of our stuff in our packs just in case we slipped and fell into the river. There isn't a specific route or side to stay on, but usually one side will be shallower than the other, and you will have to cross the river multiple times. There were also occasional dry portions on both sides where we could let our feet warm up rather than hiking in the water the whole time. While hiking in the water, be careful of your foot placement. The river bed is made up of large boulders that are very slippery. It can be difficult keeping your balance in the swift current, and we both lost our footing and slipped a couple times. This is where the walking stick comes in handy! 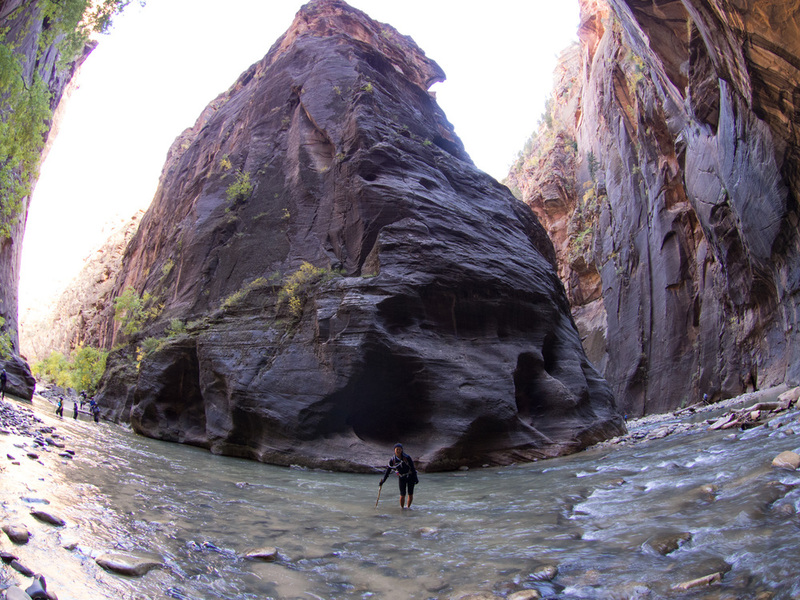 Although it was a very short hike, it was still great to revisit the Narrows and remember how beautiful it is. When we hiked it in June 2012, the water was actually a very pleasant temperature, but there were also large crowds to deal with. Last year the deepest portion was close to the beginning, and it reached up to my chest. This time around it only reached mid thigh. If we were to do it in the fall again, I would be probably rent a dry suit so that I could be more comfortable and hike in the water longer.